Choosing to euthanase a cherished companion animal is difficult enough for adults who are faced with such a horrible decision. What's even harder for many parents is finding a way to help their children understand and accept the fact that the time has come to help their pet to die. Whether the animal is a dog or a hermit crab, a cat or a goldfish, the relationship between children and their pets is unique and irreplaceable. Pet loss can be very traumatic to a child, depending on the important role the pet played in the child's life: companion, friend, admirer, playmate, defender, love object, sibling, or confidante. When a beloved pet dies, the pain can be deep and enduring, and the trauma can result in feelings of insecurity, anxiety, anger, guilt, helplessness, distrust and fear. Yet it doesn't have to be that way. Children can be helped to cope effectively with this very difficult life experience, even when the death happens through euthanasia, provided that we consider what the pet means to the child, take into account the child's developmental understanding of death, and carefully plan how the pet's euthanasia is presented and conducted. Be open and honest. If the pet is terminally ill, death is pending and euthanasia is necessary, tell your children as soon as possible so they will hear it first from you and not from someone else. If they ever discover that you distorted the truth or lied to them, they'll have a great deal of trouble trusting you again. That grief is normal and necessary, and it's all right to feel sad : "This is how we feel when someone we love dies." That it is the pet's death (not something your children did or failed to do) that makes you sad: "Mummy and Daddy are very sad because . . ."
What "dead" means: "The animal's body stops working and won't work anymore." That death is not the same as sleeping: "When we sleep our body is still working, just resting." Avoid the common phrase for euthanasia, "put to sleep" as it can trigger sleep problems or intense anxiety over surgery and anesthesia. Better to say the pet will be helped to die peacefully and without pain. ​That the pet has not "passed away", "left us" or "gone on." Such phrases imply the pet is on a trip and will return, leave children feeling rejected or abandoned, or encourage them to go searching for the lost pet or hold out hope for its return. Old age: "When an animal gets very, very, very old, his body wears out and stops working." Terminal illness: "Because the disease couldn't be stopped, our pet is very, very sick; his body has worn out and has stopped working." An accident: "A terrible thing happened (hit by a car, etc. ); our pet's body was badly hurt and couldn't be fixed. It stopped working." Don't blame the vet. As a result your children may develop fear of vets and other health care providers. Include children in the euthanasia decision. Never euthanase a family pet without telling your children first, even if they're away from home. Children need help in understanding why the decision has to be made and a feeling that they've participated in making it. They also need an opportunity to say good-bye and make the most of whatever time they may have left with the pet. Encourage children's involvement in the pet's euthanasia. Let them be present during the procedure if they so choose. The reality of a peaceful death is far less traumatic to children than their terrible fantasy of it. Encourage children to see their pet after death, which reinforces the reality and removes the mystery and fear of death. Explain what will happen to the pet's remains. If you plan to have your pet cremated, explain that your pet will be taken to a pet crematory, a place where the pet's body will be turned into ashes. Then your family will take those ashes and (scatter them; bury them in the backyard; keep them in an urn; etc.). Plan a memorial ritual. Decide in advance what you will do with your pet's remains, how you'll honour your pet's life and keep its memory alive. Encourage activities to help your children experience and express their love and grief (drawing or painting pictures; compiling an album, scrapbook or memory box; brainstorming all the good and quirky things about their pet; view old videos or home movies; writing or sharing memories; planting a shrub or tree; making a plaque or pebble memento; make a paw print memento; source books on pet loss - see below). Respect and encourage your children's needs to express and share feelings of sadness. When you bring up the subject, you're showing your own willingness to talk about it. When in doubt about your children's thoughts and feelings, ask. Don't feel as if you must have all the answers; sometimes just listening is enough. Expect that young children will ask and need answers to the same questions over and over again. Don't cut off their feelings by noting how well your children are handling their grief or how brave or strong they are. Let them see you upset and crying, which implies that it's all right to cry for those we love and lose. Don't get a new pet in an effort to replace this one. Getting a new pet too soon may imply to children that their grief is unimportant and unnecessary since everything is replaceable anyway (including the children themselves). They also may react with anger and guilt, rejecting the new pet and feeling disloyal to the one who died. Inform others of what's going on in your children's life. Ask neighbours, teachers, relatives and friends for extra support and understanding of your children right now, and for help in keeping a watchful eye on them at this sad and difficult time. It's over thirty years since the publication of the first Mog title: now, in this the twelfth story we bid her farewell. Feeling the need to 'sleep forever' Mog dies peacefully in her basket, though that eternal sleep is not entirely upon her, ' a little bit of her stayed awake to see what would happen next.' What she sees is the Thomas family grieving and their efforts to install a new ginger kitten as family pet - a pretty 'stupid one' is Mog's initial impression. But gradually, under the expert guidance of her ghostly predecessor and Debbie's unconditional love, Rumpus is accepted as the new family pet by the all the Thomases and Mog finally departs. A sensitive handling of what can be a difficult subject for parents and carers to deal with. The secure family relationships portrayed in the story enable the children to transcend their grief and cope with the new addition to the household. Roly the cat is old and tired - so old that he sleeps all the time and eventually he dies. The family bury him in the garden and, at first, the children find they are too sad to play. Gradually they learn to live with their grief and start to want another cat but Mum and Dad aren't ready yet. It's too soon. Then a stray cat arrives on the doorstep, slips inside and moves in. But the children never forget Roly - he's always with them in their memories. This sensitive story deals well with emotional loss without introducing the concept of heaven or life after death. When a small boy is told that his pet mouse has died, he can't at first believe it. But gradually, with the help of his family, he comes to terms with his pet's death. 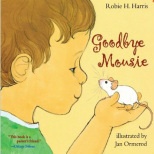 Beautifully told by award-winning author, Goodbye, Mousie is a perfect book to help children cope with loss. My cat Barney died this Friday. I was very sad. My mother said we could have a funeral for him, and I should think of ten good things about Barney so I could tell them...But the small boy who loved Barney can only think of nine. Later, while talking with his father, he discovers the tenth -- and begins to understand.